I love kale. There, I said it. I know its the in thing to eat but I truly love kale. On a recent trip to Farm Boy, my good friend Tanya and I found kale. 4 bunches for $5. Both of us thought it was a great deal because usually we find it 2 for $5. Then we picked one bunch up…. Each one was that size. Beautiful kale and from Canada too. 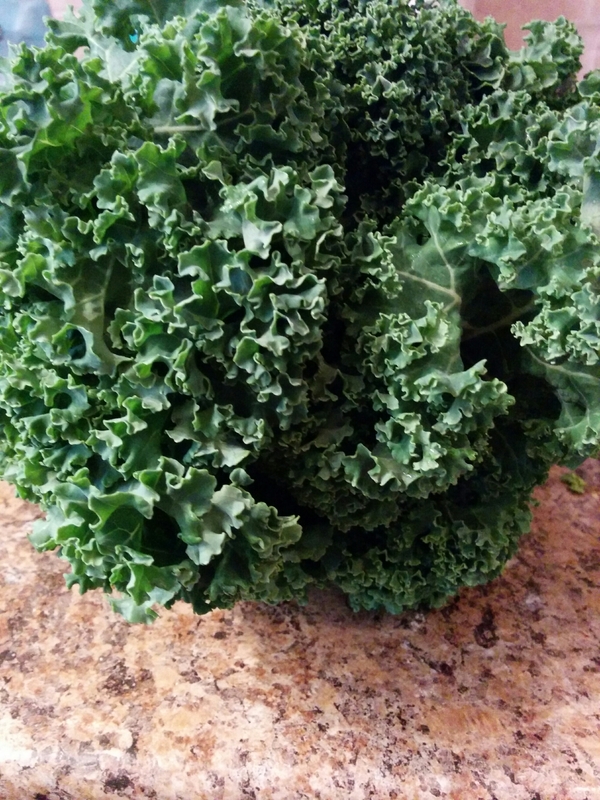 We ended up only buying 2 so this past week we’ve been eating kale galore, even our pet rabbit has been enjoying it too. We’ve had it in soup, I made kale pesto and mixed it with pasta, in a frittata replacing the spinach and even in smoothies. However our most favorite way to use it up us by making kale chips. It makes a great after school snack and the beat part is that I control what goes on them. and bake them. So easy and healthy! 4 -5 cups kale, washed and torn from stems into pieces. Toss in a large bowl all the ingredients. With your hands, ensure that all leaves are well coated with oil. Place a cooling rack on a cookie sheet. It helps dry out the leaves better. Spray the rack with non stick spray. Place the leaves on the rack careful not to overcrowd. Cook 13-15 mins or until leaves are crispy. Let cool and transfer to plate. Continue until all leaves are cooked.